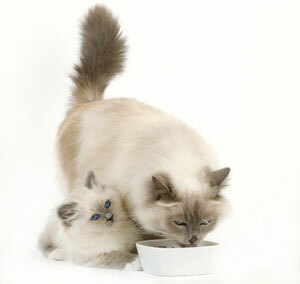 Find out what your kitten is eating before she comes home, and keep her on that for a week or so before you change it. The most important thing to remember in feeding kittens is that their digestive systems are still immature – so they can be prone to upset tummies. The best and easiest solution is to feed an ultra-digestible food specially designed for kittens (the kibble size, shape and texture in dry foods are also good for her teeth), and to feed little and often. In the wild, kittens and cats tend to snack, eating up to 20 small meals a day. So using a dry food means you can put the daily portion down (using the guidelines on the pack), and let your kitten feed at will – just as long as you are sure no other pet will snaffle it before she does! During this period the kitten grows very fast. By the end of four months, it will be five to seven times heavier than its birth weight. The kitten’s skeletal structure is also developing at this time and its energy needs are very high. At this point, the kitten’s growth slows down. This allows the skeleton to strengthen and muscles to develop. Energy requirements remain very high. Kittens have two sets of teeth – the first, the milk teeth, appear at around two weeks of age. The final set of teeth will be in place at the beginning of the second stage of growth, between 4 and 6 months. When a kitten is born, its digestive system is not fully developed and therefore its food must be specially formulated to ensure digestive safety. The kitten’s digestive ability increases over time. Between the 4th and 12th week of life, the kitten is particularly vulnerable to infectious diseases as its immune system is not yet fully functional, and the immunity gained from its mother’s milk is decreasing. ROYAL CANIN®’s kitten food contains a unique formula designed to help the kitten build their own natural defences. A synergistic complex of antioxidants (including Vitamin C and E, taurine and lutein) helps support natural defences. Mannan-oligo-saccharides are also included to help support defences in the intestinal mucosa and help support the development of beneficial bacteria in the intestine.